The Fonz was a TV character during the 70’s and 80’s. He was the coolest guy on TV. 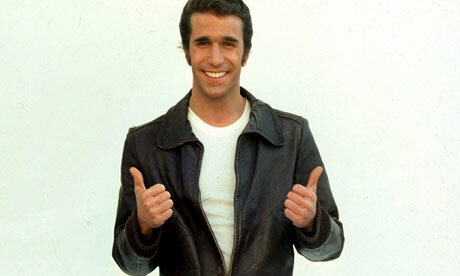 Fonz had no problems and could solve anything; always with a smile, a thumbs up, and an “ayyyy”. Recently I saw an interview with Henry Winkler, the actor that played The Fonz. It was very eye opening. Today Henry Winkler is 71. Here are some facts about his life. His teachers and parents thought he was stupid. His parents would refer to him as “Dummer Hund”, which translates to “Dumb Dog”. Turns out he was dyslexic (back then it was not easy to diagnose). He learned by memorizing as much as possible and improvising the rest. He applied to 29 colleges and was accepted to two. He graduated college and went on to the Yale School of Drama. For his audition for the Yale School of Drama, he improvised a Shakespearean monologue, by making it up, and got admitted. Despite the negative messages he received from his parents and teachers at a very young age and a severe learning disability, at the age of 27 Henry Winkler was one of the biggest stars in Hollywood. He had to be creative to overcome obstacles by thinking outside the box. He never gave up. He reinvented himself several times; he is also a producer, a director, and a writer. Not bad for a guy who read his first book at age 31. After seeing the interview, I believe The Fonz is even cooler. Be tenacious and grateful in everything you do.